As the Great War slowly came to what would be its end on November 11th, 1918, the Allies found themselves in the Hundred Days Offensive. It was the final period of World War One in which they launched a series of attacks. The Fifth Battle of Ypres was one of these final battles in which the Allies made significant progress. German morale had waned significantly since the Spring Offensive in July. This coupled with reinforcements from America, who joined the Allies in the war in the summer of 1917, provided Allied troops with the perfect opportunity for a powerful attack. As dawn approached on the 28th of September the Allied troops sprang into action at 5:30am on the muddy land of Flanders Fields in Ypres, Belgium. In total, there were 10 British divisions, 12 Belgian and 6 French. The plan was to attack German defences over as wide a front as possible, with each countries’ divisions attacking from a different angle. Unfortunately for the German soldiers present, they only had around, if not less than, 5 divisions as a defence against the attack. The Allies quickly began to see progress, taking back land at Westhoek only 3 hours into battle. Not all of their progress was this easy however, and they met particular resistance at Anzac Ridge. To counter this, they set off smoke shells. This allowed the Allies to successfully attack the isolated pillboxes that German troops had fortified in the area. As night fell on the first day of attacks, Allied troops had made a total progress of 6 miles and recaptured most of the land at Passchendaele. 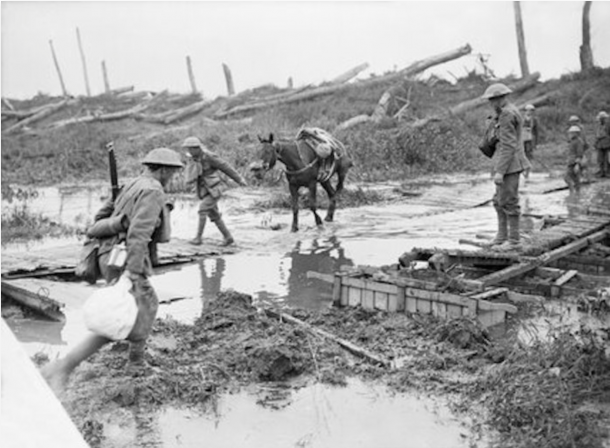 The next day troops faced heavy rainfall, a common issue when battling in Ypres, which turned the already muddy land into a squelchy mess. This made further advances more of a struggle, causing transport issues and delaying the delivery of important resources to the front line. Despite this, the Allies continued on to day two of the offensive, September 29th, where they also managed to secure the majority of the high land in Ypres. Sadly, while the battle had been going in their favour, they began to find their supplies running low, meaning they would soon have to stop the battle. Knowing this, the Allies bravely continued the major offensive in incredibly cold and damp conditions until there were not enough resources left on October 2nd. By the end of the battle, the condition of the land surrounding them was so bad that roughly 15,000 rations had to be dropped by parachute from planes. British troops had also found themselves in a favourable position to break through Germany’s Hindenberg Line at Bellicourt Tunnel. 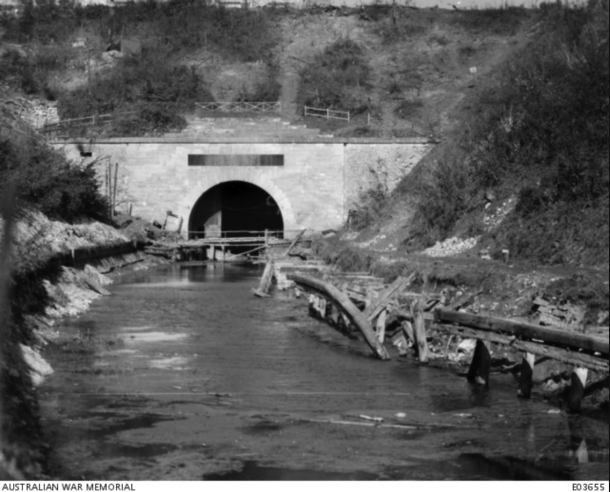 It contained a canal spanning 6,256 yards, connecting Cambrai and St. Quentin, this was where The Battle of Bellicourt Tunnel would ensue. The British 46th North Midland Division stormed the area. There they found themselves up against tough German defences who used the barges in the tunnel as a shelter for their reserves and had a strategically placed dugout on the other side. It was this key moment in time that would help lead the Allies to victory and break through German defences once and for all.